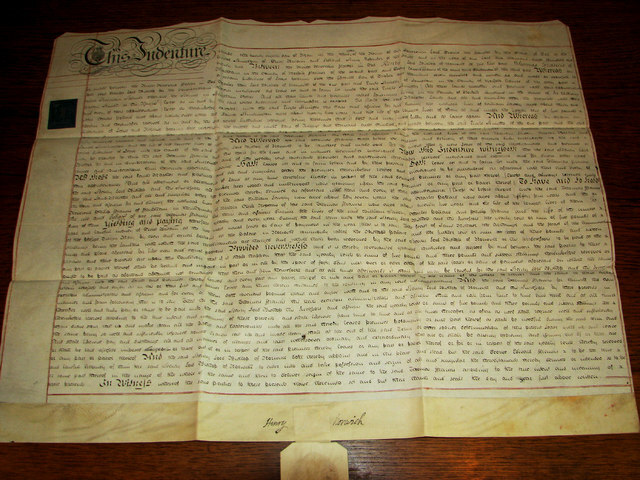 Indenture of Lease between the Lord Bishop of Norwich and Thomas Francis, dated 28 May 1822 and written on parchment. It is a contract between Henry (Henry Bathurst, 1744-1837) the Lord Bishop of Norwich and Thomas Francis, who at the time was one of the bishop's main leaseholders of land on Heigham Holmes > Link in the parish of Potter Heigham. The bishop's signature can be seen above his seal tag at the bottom of this parchment. Heigham Holmes is an isolated and little known area of marshland in the civil parish of Potter Heigham in North Norfolk. The area extends over about 500 acres and is bounded by the River Thurne in the south, Candle Dyke and Heigham Sound in the west, Meadow Dyke in the north and Eelfleet Wall in the east. Until well into the 19th century, the incumbent Lord Bishop of Norwich owned almost all of it, leasing parcels of land to tenants for an annual fee of £5. Today Heigham Holmes is a nature reserve managed by the National Trust, who acquired it in 1987 and over the years restored it back to grassland by reinstating the old water levels and creating new dykes, pools and foot drains. It is described as a unique and internationally important wetland, comprising reed-fringed flood banks and open water, grazing marshes, scrub and wet woodland, interspersed by numerous dykes and pools characteristic of the Norfolk Broads landscape. Heigham Holmes is open to the public for only one day every year, with the only access being a floating, automated steel-decked bridge over the River Thurne, known as Martham Ferry > Link . Rumour has it that during the Second World War part of Heigham Holmes was used by the Special Operations Executive (SOE) as a secret landing ground. No evidence has to date been found to substantiate this speculation. The term parchment is a general term describing an animal skin which has been prepared for writing or printing, usually calf, goat, or sheep skin. Parchments made from calf skin are called vellum, from the French 'veau'. Parchment has traditionally been used instead of paper for important documents, as it was believed that it would last much longer than paper. © Copyright Evelyn Simak and licensed for reuse under this Creative Commons Licence.